The only part I don’t like about a new release is updating my sample apps. Just like with last year, I don’t have time to update all my apps. I’m just going to focus on the ones that are important to me. vLogic looks like a good place to start, even though I just built the 2012 version a couple months ago. It’s one of those apps that I immediately wanted to add features to right after I posted it. Event support - vLogic scripts now come in two flavors. Command scripts are invoked by the user when they click on the menu command. Event scripts are invoked automatically when actions take place. These scripts hook right into the web service command events, so you can run scripts during a checkout, add folder, delete item, and so on. I also put in hooks for the OnLogOn and OnLogOut event in Vault Explorer. There is a naming convention to determine which .ps1 files hook to which events. See readme for more details. Note, the example event scripts are inactive after installation. You need to remove the ‘_’ prefix and restart Vault Explorer for those scripts to run. 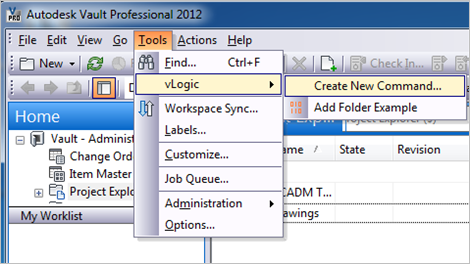 Easier navigation - Hold down the SHIFT key when running the “Create New Command” menu item and an explorer window will open to the vLogic folder. No Visual Studio required to write custom commands and event handlers. Commands can be updated without having to exit Vault Explorer. Easy to share scripts or modify scripts from others. Your old scripts need to move to the “%ProgramData%\Autodesk\Vault 2013\Extensions\vLogic\command scripts” folder. Some API functions have changed in 2013. 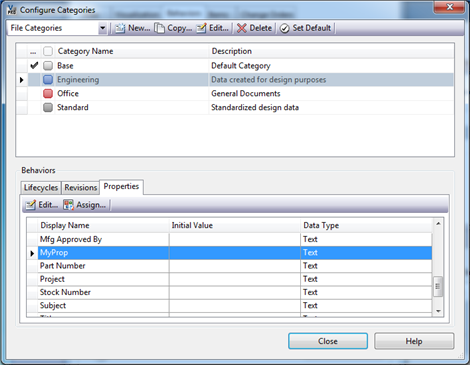 See the Vault 2013 SDK documentation for a list of all changed functions. If the parameters are wrong on an API function, it will result in a runtime error. Run the install and start Vault Explorer. Under the Tools menu is the vLogic menu. This is where you can run existing scripts or create new scripts. 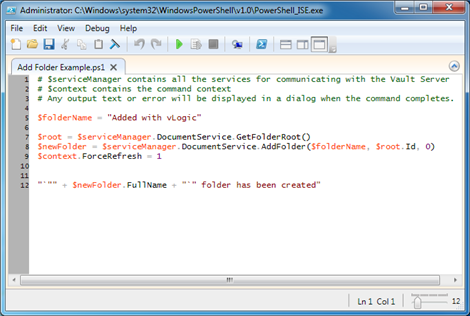 To create a new command script, select Create New Command from the vLogic menu. After giving your script a name, you will have to re-start Vault Explorer. When the program re-starts, your command should show up in the vLogic menu. To edit a script, hold the shift key and click on the command. The PowerShell ISE should pop up, allowing you to edit the script while Vault Explorer is running. When you are done with your changes, save the file in the editor. To run a script, run the command from the vLogic menu. To delete a script, go to %ProgramData%\Autodesk\Vault 2013\Extensions\vLogic\[script folder] and remove the .ps1 file. You can also add commands by putting .ps1 files into the appropriate folder. Although the Vault Mirror source code is still part of the Vault 2013 SDK, the compiled application is now a free download the Vault App Store. Which brings me to my next point. Anyway, be sure to check it out periodically for new apps. If you want to make some extra money writing your own apps, see the Autodesk Developer Network for more information. I’ll still be posting apps to this blog too. The difference being that apps in the store are high quality, and apps on this blog are experimental. If you are still reading by this point, you shouldn’t. You should be checking things out over at the Vault App Store. So I’ll be quiet now and leave you to it. If you are upgrading your server to Vault 2013, but still want to use Inventor 2012 with Vault, here are the steps you need to go through. Step 2: There is no step 2. Everything should be working. Also, any 2011 client that has been patched to work with Vault 2012 will also work with Vault 2013. If you have a 2010 client that has been patched to work with Vault 2012, I don’t think we provide official support for working with Vault 2013 (it should still work though). 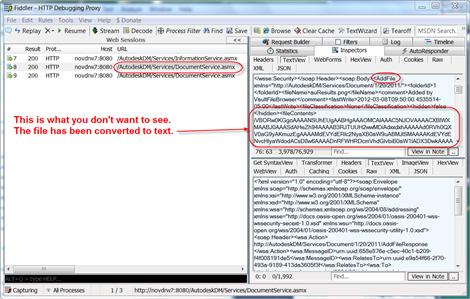 This post has been brought to you by the Web Service Compatibility feature in the Vault 2013 API. Enjoy. We’ve officially released the Vault 2013 line of products, so I can now talk about the new API features. This has been another good release for the API, some very nice stuff has been added for you to do interesting things with. I’ll also list some of the more noticeable changes you will run into if you are coming from the Vault 2012 API. In the coming weeks, I’ll be elaborating on most of these features, but for now I’ll just give you a high level view of the new API. Vault Professional allows you do define your own entity types. You are no longer forced to use Files, Folders, Items and Change Orders for all your data. Custom entities support properties, categories, ACL security, links and lifecycles (the same engine that files use). The only behavior you might miss is versions and revisions. Through the API you can create custom commands, custom tabs, custom new and delete behavior, and lifecycle events for you custom entity types. Vault Server 2013 contains two sets of web services. Once set is the new 2013 services, but the 2012 services are still there too. This means that 2012 clients will still work with the 2013 server. No update required. Note: Compatibility does not apply to plug-ins such as custom commands, job handlers and event hooks. The IJobHandler interface has some new additions. You can now run code during startup and shutdown. You also have hooks for sleep, which is right before Job Processor goes idle, and wake, which is right after the idle period is over. Job Processor itself has some enhancements. It can use Windows credentials for login (however a Vault license is still consumed). There are also new command line options for Job Processor so you can do service related operations, such as pause, resume and stop. Transferring entities in a replicated environment just got much easier. First transfers usually happen instantly instead of requiring you to wait for a few minutes. Also the WebServiceManager will automatically transfer ownership for you attempt to edit an entity that is owned by another workgroup. If your program is logged in as an administrator, it can switch its credentials to that of another user. This is useful for utilities that edit Vault data, but you want it to preserve the user that originally created the data. All the SDK DLLs have been moved over to .NET 4.0. Since 4.0 uses a new CLR, you can’t use projects that are 3.5 or earlier. All SDK samples have been updated to Visual Studio 2010. All SDK DLLs now have a strong name. It’s recommended you strong name your project if possible. Change: Autodesk.Connectivity.WebServicesTools.dll has been removed. All the code has been moved into Autodesk.Connectivity.WebServices.dll. So no code change is needed, you just have one less assembly to link to and deploy. The WebServicesTools namespace has not changed. You can now define the system name for objects created through the API. This gives you a reliable string that you can use to look up things like property definitions and categories. The code for managing file lifecycles has been moved to the new lifecycle service. 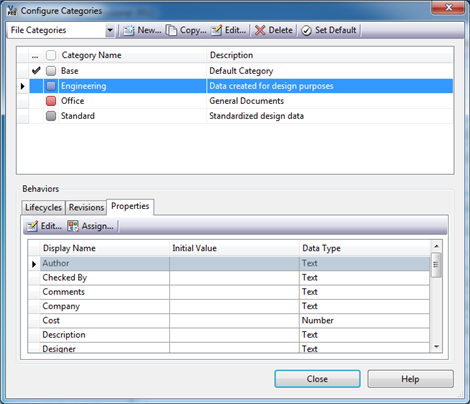 The functions have been genericized to use entities instead of files. This change was done to support lifecycles on Folders and Custom Entities. Web service functions have been updated to transfer a ByteArray object in most cases where byte  was used, for example, upload and download. This change was done to support the compression feature. By default, compression is not used. However the option is there to use LZ4 compression when transferring binary data. It’s time for everyone’s favorite game show, What’s Wrong with this Code! Today we are going to look at some code that is supposed to check if the logged in Vault user is an administrator or not. Have a look at the below code and try to spot all the things wrong with it. You can assume good data is being passed in. You can also assume that unexpected errors, such as network failures, are handled in a higher level catch block. The question has come up a couple of times on how to associate Property Definitions with a Category. So I thought I would write up the code and post it here. The code is a bit hard to follow unless you understand a few things about Categories. A Category is a behavior that is a container for other behaviors. Things like property definitions, lifecycles and revision schemes can be thought of as living inside a category or set of categories. So in the case of properties, we are adding a new property definition to a Category’s collection of behaviors. So a lot of the code deals with Behavior objects, which is an abstract representation of our property definition. The good news is that the code below can easily be re-purposed to associate revisions and lifecycles to a Category. In this example code, I’m going to take a UDP I created, MyProp, and associate it to the Engineering category. After I ran the code, my Engineering category looked like this. For a while, I’ve been looking for a good way to detect if binary transfer is set up properly for a Vault app. I’ve finally found that way, and its name is Fiddler. If you don’t know what Fiddler is, it’s a tool that lets you monitor HTTP traffic on your computer. It’s the type of utility that has millions of uses, but I’ll be focusing only on using it to help with Vault programming. Since Vault uses web services for server communication, you can use Fiddler to verify that your files are transferring properly. One of the aspects of the Vault API is that you need to configure things very specifically in order to get files to transfer in a binary mode. If you get a step wrong, then files get transferred as text. But your app still works, so it’s a tricky problem to locate. I’ll show you how to use Fiddler to verify the binary transfer. Run your app. Make sure to have a real computer name as the Vault server; do not use “localhost” or “127.0.0.1”. Upload or download a file. The size of the file does not matter, but I suggest a binary file, such as an image. 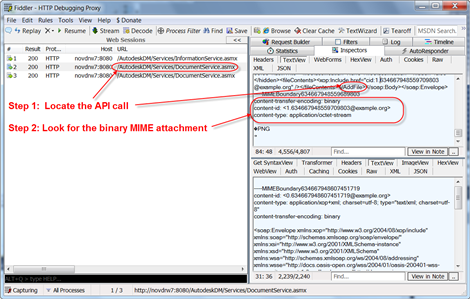 In Fiddler, locate the entry that corresponds to the API call that performed the file transfer. The left pane, shows all the HTTP requests. Vault API calls will show the URL of the web service. The right top pane shows the outgoing request. For Vault API calls, this has the raw SOAP data, including the function name and parameter set. The bottom right pane shows the incoming response. For Vault API calls, this has the raw SOAP data, this has the function name and return values. You can use either pane on the right to find the function name. It’s best to use the Text View and scroll to the bottom of the pane. The element directly inside <soap:Body> is the function name. If you are doing an upload, you want to check the outgoing pane at the right-top. If you are doing a download, you want to check the incoming pane at the right-bottom. If you configured things correctly, there should be a section at the bottom indicating a MIME attachment. There may also be a gibberish representation of the binary data. If you configured things incorrectly, there will be no MIME attachment. The file data will show as a large text string in a function parameter or return value. NOTE: When things are configured incorrectly, with MTOM not enabled, you can use the XML View in Fiddler. When MTOM is correctly turned on, then the XML View is blank. In case you missed the news, we have officially launched our new PLM product. Autodesk is now a PLM company! It was an event so awesome that we had to add an extra day to February. Regarding this blog. The current plan is to stay focused only on the Vault API. And no, I don’t know where you can get details on the PLM 360 API.